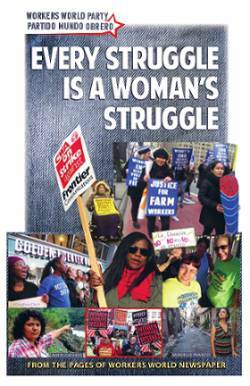 Workers World online editor John Steffin interviewed Sara Flounders, co-director of the International Action Center, on March 17. Flounders is in Caracas, Venezuela, as part of a solidarity delegation of a dozen anti-war leaders from all over North America, organized and sponsored by the U.S. Peace Council. Members of the delegation arrived in Caracas on March 9 and 10. As of March 18, the delegates have finally begun returning home after American Airlines canceled their flights. A full list of the participants is at the end of this article. Workers World: We saw pictures posted on social media of Peace Council delegates meeting with President Nicolás Maduro. What was the purpose of the meeting? Sara Flounders: The U.S. Peace Council delegates, Comité de Solidaridad Internacional Venezuela (COSI) and President Maduro met to discuss strengthening cooperation and communication. Suggestions were for sending more delegations to Venezuela and more social media exchanges. When Maduro heard from Sarah Martin that there was a demonstration for Venezuela in Minneapolis happening that day, he immediately sent a twitter message to them. The Venezuelans are very supportive of the upcoming action on March 30 in support of the Bolivarian Revolution in Washington, D.C. They see it as a next step in solidarity in response to the crisis. We told Maduro that the Boston Bus Drivers Union (Steelworkers Local 8751) were driving a bus to D.C. and Maduro said he was ready to join them! WW: That’s great to hear. I’m sure they would be happy to have him. What is Maduro’s perspective on the current situation? SF: Maduro said that for 200 years, since the time of Simon Bolivar and U.S. President James Monroe, there has been a struggle between sovereignty and colonialism. But in a larger way the battle of all humanity today is a struggle between socialism and capitalism. He said they face right now the heaviest sanctions ever imposed! Even for essential medicines. All their accounts are stolen. The situation is so severe that they are preparing for the U.S. to attack. Through Community Councils, the organizing units are being told to start storing food, water, batteries. While we met, Maduro received a threatening tweet from Marco Rubio and one from Elliott Abrams. He read them to us with great laughter. He said his government always has to be ready to talk, of course. But Venezuela’s path is determined by all the people, not by a government Washington appoints. WW: And what is the determination of the Venezuelan people? SF: After our meeting, we could see the level of determination first hand. We went to the People’s Encampment guarding the Presidential Palace. Thousands are rotating on security 24 hours a day in anticipation of an imperialist attack on the president. We saw people’s militias and mass outpourings of organized community groups, housing groups, student groups, etc. That day (March 15) the Oil Workers Union had a big rally. They said: We are armed and ready to defend what belongs to all of us. Madeline Arias, head of the Ministry of Urban Agriculture, introduced us to the union that day, and the union let us each give a short revolutionary greeting to the demonstration. The petroleum union’s women’s caucus told us they want to meet with women from the United States. Since we were unable to return home as expected, we also attended a massive demonstration in support of the Bolivarian Revolution on Saturday, March 16. There were tens of thousands of people out in the streets. Hundreds of buses brought people into the city from surrounding areas. These kinds of demonstrations have been taking place every Saturday since the coup. WW: The corporate media in the U.S. say that the people do not support Maduro. Based on what you’ve told us, that is another imperialist lie. SF: Absolutely. These massive rallies really confirm that the people are mobilized, determined, very enthusiastic and combative. They come with their unions, housing or community groups, schools. They know the right wing is mobilizing. So they are determined to far outnumber them. It is a political battle in every sense.